It's coming to the end of an era where I have given up my job in retail and starting a new job in the field I am studying towards. 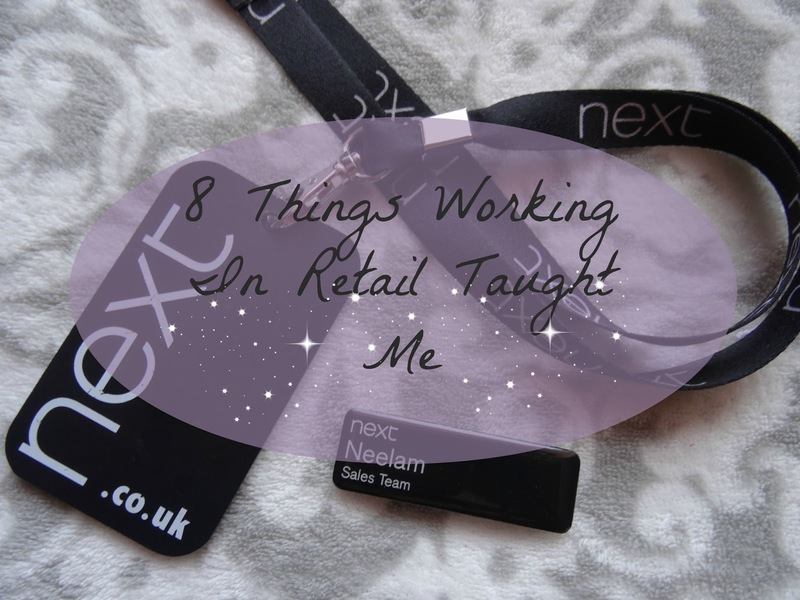 I have been working in retail for around 2 and a half years, so I have a fair bit of experience to share with you and some tips for people who are just starting out in the industry. I got my job at Next, Westfield back in December 2012 just before the mad rush of the boxing day sales - cry for me! It was my first ever paid job and I stuck through it whilst studying for my A levels and moving out to start uni. I first started off working Monday evenings and Saturday mornings, but once I finished 6th form, I changed to working Saturdays and Sundays. It sounds painful to dedicate your weekends to your job and there was a lot of things I had to miss out on, but a lot of my friends also had weekend jobs so we would mostly go out during the week anyway. So given my experience I thought I'd share a bit of my experience and things I learnt along the way. 1) Be prepared to be flexible. You may have a contract that requires you to work certain hours, but you will be asked quite often to stay an extra hour or two or maybe even start a few hours earlier. It's common and if you don't have any plans after then it's worth getting a few extra quid while you're there! Most managers won't really care if you're at school or uni and have deadlines to meet - if they know you have a few hours spare then they will try their best to get you to work. Saying that, if you do extra hours often, then don't be surprised when they begin to cut your hours. Every store and department goes through it, some more than others, but they'll soon have more hours to give so don't worry too much about it - if you find you're struggling to make ends meet, then maybe talk to your store manager about increasing your contracted hours. 2) You're allowed to say no! If it's your first job and you want to make a good impression but you can't do that extra saturday shift then say no. You're entitled to and shouldn't feel forced to do anything you can't do. Of course, if your manager tells you to serve the group of rowdy customers in the queue, you can't really get away with rejecting the request - it's your job to at the end of the day. But you're not expected to always say yes. 3) Don't take things too seriously. The pressure gets to everyone in retail and if your manager seems like he/she is nagging, then believe me when I say they've been nagged at earlier that day. There are a lot of things that go on behind closed doors and there's always pressure to meet targets and get a million and one things done before the end of the day, but realistically, it's not always possible. Just do your job and do it well - then you have nothing to worry about. 4) Always be professional and stay calm at ALL times. There may be times where you have to deal with angry customers, even if they're not angry at you, they can be a bit difficult. But remember not to give attitude and be apologetic. Nothing's worse than a customer complain about you. If you don't know how to handle the situation, ask help from a senior member or your a colleague that has worked at the store for a long time as they're used to the situations. I would always try and help people who were new and were being yelled at for no reason, the poor things always look shaken up, so be supportive with your colleagues, they'll really appreciate it. 5) Keep note of your hours. If you find yourself doing a lot of overtime then it's a good idea to keep a note of the times you've started and finished. Normally a clocking in system is quite accurate, but where I worked, the managers had to approve the extra hours you done and sometimes they can forget. So keep a note and be honest. There are lots of ways your manager can find out if you actually did 5 hours extra - it's not going to go down well if you lie about it. At the end of every month I would calculate how much I'm supposed to earn and compare it to my payslip. I also print off ever payslip to keep it as a record - that's probably just the inner Virgo in me. 6) Confidence will come to you. Anyone who has known me for a few years will be able to tell you just how shy I used to be. I hated talking to people and was always really quiet. But I soon learnt that working in retail meant you had to talk! My manager always used to tell me to approach customers that looked interested in something and working in the Home department, this was essential! At first I didn't want to bother people and thought they'd ask if they needed something. It was especially daunting to approach groups of people or people who looked like they 'knew their stuff'. But it didn't take long before I was confidently approaching customers and talking to every customer on the floor. I suppose it has to do with how much you know, it's understandable not to know the ins and outs of every product after one week, even a month for that matter! But the more you work and the more questions you are asked, the quicker it takes for you to learn everything - then you'll feel like you can answer the customer's questions without having to grab someone else. It just comes after time, so don't worry about it! 7) Be prepared to blag it. Ok, so working in the Home department meant I got a lot questions like 'What looks better, bright floral curtains or this polka dot one?' and in my head, I'd be like 'Really?! ', but actually the customers value your opinion and they think you know the current trends because you work in the store (you more than likely will do). In this case, I would ask questions like, 'What colour furniture do you have?' or 'Is your room quite big and airy?' to get a picture of where they're going to use the product and try and use my 60 Minute Makeover memory to think if it would suit. These questions also make you look like you know what you're talking about even if you don't and 9 times out of 10, the customer will go with your opinion. But don't be silly about it and make things up. If a customer s interested in a Coffee table then don't claim it's made out of the finest wood in the country when really it's a piece of MDF covered in wooden veneer - be smart about it. 8) Smile, it doesn't hurt. Sometimes its so hard to show that you're not exhausted from that pup crawl you went on last night and you really could've done without the 7 a.m. start this morning, but a friendly smile will do no harm! When a customer sees you smile at them they're more inclined to browse the shop or be friendly to you - which may not seem important to you at the time, but nothing is a better pick-me-up than a nice customer. If you're scared to talk to a customer or see a couple bickering over what colour sofa they should invest in, then just whip out a smile and they'll know that they can come to you if they need anything. Plus if a customer sees you smiling, they're less likely to give you any trouble! I hope these help, it hasn't been long since I've quit retail and writing this post has weirdly made me miss it! But retail really isn't as easy or glamours as it looks and any of you who currently work there will know exactly what I mean. It's a great place to work if you like that interaction and enjoy the diversity in work, because everyday really is different and you meet some amazing people out there!